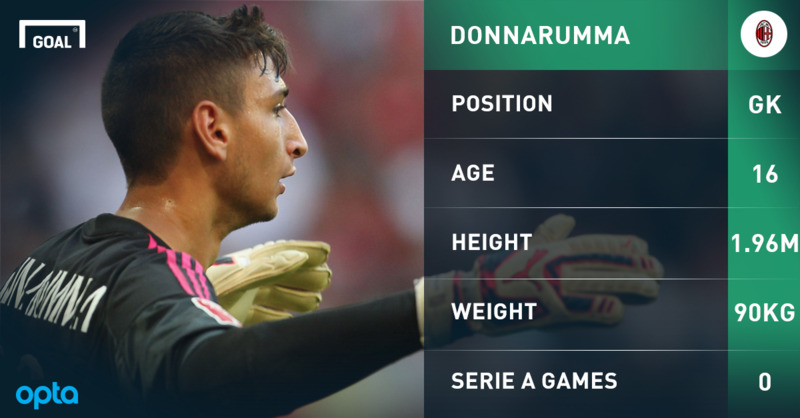 On Sunday at San Siro, Gianluigi Donnarumma is expected to make his Serie A debut. The AC Milan goalkeeper is just 16 years old. It is just his face that betrays his tender age, though, because, between the posts, Donnarumma looks and moves like a seasoned professional. Indeed, at 1.96 metres tall, he is an imposing figure. Just ask World Cup winner Toni Kroos, whose spot-kick Donnarumma saved during a penalty shootout between Milan and Madrid at the end of a pre-season fixture in Shanghai. Donnarumma has enjoyed a remarkable rise to prominence. Just two years after joining Milan's Giovanissimi (the club's Under-15s), he has forced his way into the first-team squad. However, Donnarumma has long been considered one of Italy's most exciting prospects, having first come to the attention of the country's elite clubs while being schooled by coaching guru Ernesto Ferrara at Club Napoli Castellammmare. Indeed, Inter made a concerted bid to sign Donnarumma, who had enjoyed a short but impressive trial with the Nerazzurri. But then, as the teenager explained in an interview with VivoAzzurro.it, "Milan intervened. After calling the president of my club, they decided to take me. Milan are the team of my heart. I have always supported the Rossoneri and my dream is to become one of them." Mihajlovic wasted little time in making that wish come true. Upon taking charge of Milan in the summer, the Serbian coach immediately realised what a precociously gifted goalkeeper he had on his hand and included him not only in the illustrious friendly clash with Madrid but also the squad for the Trofeo Tim in Reggio Emilia. Donnarumma proved particularly impressive in the meeting with hosts Sassuolo, earning Milan a 4-3 victory in the shootout with saves from Domenico Berardi and Francesco Acerbi, and is now set to get the chance to shine against the Neroverdi at the Giuseppe Meazza this weekend. It would be an incredible story, as he would be taking the place of former Diego Lopez. The former Real Madrid shot-stopper has struggled of late and the obvious replacement would be Christian Abbiati, who made his Milan debut in 1999, the year Donnarumma was born! However, Mihajlovic is set to put his faith in youth, having seen Donnarumma turn in an impressive performance in Wednesday's Trofeo Luigi Berlusconi clash with Inter at San Siro. Super-agent Mino Raiola will certainly have no doubts about Donnarumma's ability to cut it at the highest level, having claimed in April: "At Ajax or Atletico Madrid, he would already have played in the first team." Inevitably, Donnarumma is already drawing comparisons with goalkeeping icon Gianluigi Buffon, who made his Serie A debut with Parma at just 17. And Donnarumma freely admits that he views the Italy and Juventus skipper a role model. "Ahead of me I have the example of Buffon, the greatest of all, whom I hope to succeed in the national team." Donnarumma has a very long way to go yet before he can begin seriously consider achieving such lofty ambitions but it is a nice coincidence that Buffon's Serie A bow came against Milan because 20 years on from that special day in Parma, the Rossoneri feel that they may have found a worthy heir.